Make every moment count, from the time you get out of bed. Choose what you will invest your time and energy into, both to give more and to get a bigger payoff. Cut the chains that bind you, releasing the weights that drag you down, so you can rise to the occasion – every occasion, every day, every breath of life. Why are you here? Let Swami Nirmalananda help you answer the question for yourself. Set the tone for how you want to live in 2019. Your New Year’s retreat includes Svaroopa® yoga poses, breathing practices, chanting and meditation with Swamiji. 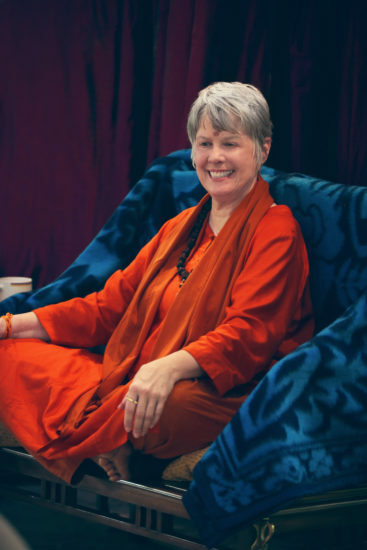 Learn from her discourses on yoga’s ancient teachings, and explore your choices and decision-making process through vichara (guided self-inquiry). Gain new insight into your life and your being while you create a trajectory for the new year.